Maybe the perfect choice for ring bearers! Versatile and stylish to create your theme as this set works well for outdoor occasions and country themes and also more traditional or vintage wedding themes. Shown is the white shirt. 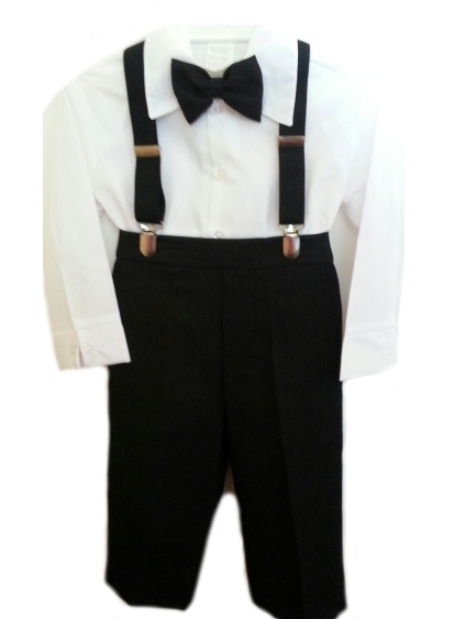 This 4 piece set includes a cotton poly shirt, slightly textured tone on tone striped black pants and clip-on bow tie, plus nice quality black elastic suspenders. The pants are a good quality wrinkle-free matte polyester. Better brand. US made. Machine washable. Spot clean the suspenders. 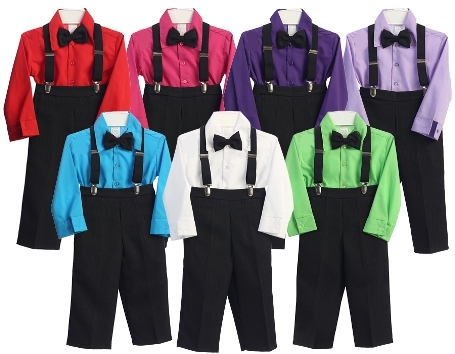 Runs true to size - except for the suspenders which are small for toddlers and may require an upgrade to a larger size which are sold separately. . Options include colored bow ties, fedora or newsboy hats and snappy shoes. Size 2 is currently sold out.